Lines of light snaked across the dark hillside—freaky, ominous, beautiful. Forest fire, I thought, gazing horror-struck from my window. Thankfully they were only “forest department fires", carefully controlled conflagrations set to regenerate vegetation. My window has supplied many such frissons—the sight of snow peaks starkly etched against a deep blue sky; of two rainbows arching over a valley together; of simmering monsoon clouds. But even on a regular day, I look out at hill ranges flowing into each other; lively crimson sunbirds and Himalayan bulbuls; chattering women nimbly balancing huge piles of leaves or wood. But land prices in the hills were prohibitive, and so were the rents. Plan C—to work with hill-based NGOs—also came a cropper. They needed experts or volunteers, not people with interests in organic farming and renewable energy who also required steady money. Then friends told us about a house for rent within our tight budget, in a peaceful hill town. Hopes sky-high, we dashed up once more. The “house" was only a big room, with a tiny study and an even tinier kitchenette. But it had a huge window looking out over an endless vista of snow-topped ranges, hills, valleys, a big terrace, a pinewood ceiling. Of course we took it—with the understanding that whoever got sick of the other’s face in the cramped space could pitch a tent on the terrace, or just take a long walk. Long walks, in fact, promptly became a feature of our hillbilly life. The woods are lovely, dark and fragrant, alive with birdsong and flashes of movement of Khaleej pheasants and deer. Anna Pozatti and Luigi Caselli, Italians spending their early retirement in the hills, are excellent walking companions who know the best trails, and are prescient when it comes to sensing our need for hot meals or special treats. Over time, in fact, good neighbours have become an essential part of our lives. Vidya Devi taught me to survive without a fridge (store spinach and coriander dipped in water). Kutty and Dolly Krishnan’s doors are always open for leisurely chats over coffee and home-made wine-sampling sessions. 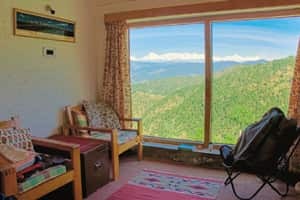 Former Mumbaikars, they moved to the hills to be close to the treks and other activities that Kutty organizes for a reputed US-based outdoors company, and have achieved full conversion—from city-slickers to small-towners. Dolly says they’re lucky to have a good local school for their two kids—a major issue for couples with children who want to escape the city—but it’s far and they have to arrange daily drops and pick-ups. An amateur potter, she has been trying to set up a kiln for years. “Nothing comes easy here," she says. And, in the next breath, “But I can’t think of living anywhere else now!" I get what she says about practical difficulties. Broadband connections, so crucial for us, are unavailable, so we experiment with Bluetooth. Any kind of repair or setting-up work has to wait for days. Forgetting an important item on the weekly trip to the market—a steep walk up and a long drive away—can seem like disaster. Creepy-crawlies are plentiful, too: Leeches are my least favourite, with scorpions not far behind. And the spiders almost feel like pets now. I’ve also discovered the joys of a small home. Apart from it being much easier to clean, I’ve realized how little we need for a fairly comfortable existence. With no fridge or microwave, we cook fresh, simple meals on a single burner. For entertainment, we catch an occasional film on TV when the cable connection and electricity both work. Haircuts are under pine trees and cost Rs20. Meanwhile, we’ve branched off in our careers. Even so, we earn much less—but we spend far less, too. The entry into the world of appropriate technologies and systems has not been launched yet, but it’ll happen. Some fundamental adjustments have occurred, such as conscious water-saving and reducing the use of plastics, which will stay with us. And that fireplace of my dreams has transmuted into a bukhari (wood stove/heater); open fires are wasteful. Can we continue living in the hills, sustaining ourselves, and loving it here? Can we find land, build that little house? I don’t know, but I feel positive. Here, I feel connected to important things, have a sense that this is close to what life is meant to be; here, we have “our" peaks, more precious than gold.